Choose from our fantastic Essentials and Seasonal fruit box selections and treat your team to regular office fruit deliveries. With a minimum order value of just £20, you can easily customise your orders to help keep everyone in your company – including the Finance Director – healthy and happy at work. Our Essentials fruit boxes include a delicious selection to keep your business at full power through the working day. With fifty pieces of fresh fruit for the office in every box, you’ll always be able to enjoy bananas, apples, pears, satsumas/clementines and plums. We keep this fruit delivery selection constant throughout the year, so you know exactly what to expect. Our Seasonal fruit box includes all of the staples from the Essentials selection along with a s range of seasonal favourites. Chosen according to availability – just as nature intended – your Seasonal office fruit delivery will include items like grapes, berries, peaches/nectarines, kiwis, sharon fruit or dates. Make your office more fruitful: it’s a breeze to order your fruit boxes online now. Or if you’d like more information, just call our friendly team on 0333 358 3310. 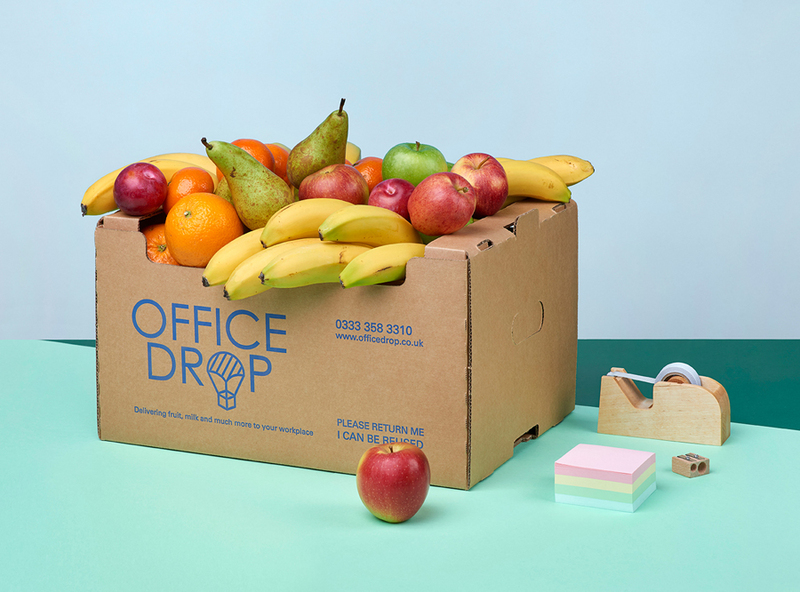 The Officedrop network equips us to deliver fruit for the office to most UK mainland areas. Deliveries can be on a regular (e.g. daily, twice weekly, weekly) or ad hoc basis. Having a fresh? fruit selection on display in the office brightens everyone’s day. It looks great, tastes even better, makes healthy eating easier, and motivates you to enjoy the good things in life – even when the pressure’s on. Fresh fruit really does contribute to wellbeing in the office. The humble apple, for instance, offers quick-releasing natural sugars that raise energy levels, with antioxidants and plenty of fibre. Bananas are a great snack too, packed with essential vitamins and minerals like potassium and magnesium. With quick-acting carbohydrates they’re ideal for anyone who regularly exercises, while plenty of dietary fibre ensures you’ll feel full for longer. Satsumas and clementines are another office favourite in our fruit box deliveries. Bursting with vitamin C, they’re better than drinking orange juice alone because they add the benefits of fibre, too. We also favour plums because of their impressively high nutrient content: they’re particularly high in polyphenol antioxidants – that means they’re good for your bones! Most of us have experienced sugar cravings in the office. Fruit with high natural sugar content can provide the quick energy boost your need to overcome that mid-afternoon slump. Having a regular delivery of fresh fruit on hand also provides a welcome diversion from temptations like biscuits, chocolate, cakes and the like. Grapes can go a long way in helping you get your daily dose of vitamin K, while berries are nutritious and low calorie treats. Strawberries are especially high in vitamin C, which can boost the body’s resistance against infectious agents. With all these wellbeing as well as motivational benefits for your team, now’s the time to treat your company to a regular fruit box delivery.